What Was The First Video Game Played In Space? The First High Definition Movie Pirated Was? In 1993, Russian Cosmonaut Aleksandr A. Serebrov blasted off aboard the Soyuz TM-17 rocket to the MIR Space Station. Stashed among his personal gear was a Nintendo Game Boy and a Tetris game cartridge. The game choice was particularly fitting because of the game’s origin in the Soviet Union in 1984. By squeezing in a few rounds of Tetris (and then some, we’re sure) while aboard the space station, Serebrov helped Tetris become the first video game played in space. We imagine fellow Cosmonaut Vasily Tsibliev and French Spationaut Jean-Pierre Haigneré enjoyed more than a few turns with the device too, giving all three the distinction of being the first people to play a video game in space. Serebrov’s Game Boy spent 196 days and 17 hours aboard MIR and, upon returning to Earth, eventually found its way to auction. In 1996, it was auctioned off as part of a Russian Space History auction hosted by Sotheby’s. 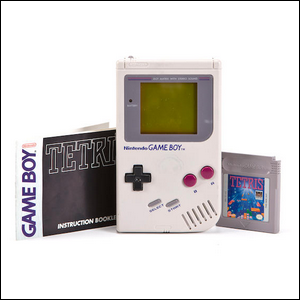 Later, in 2011, it became available again and was auctioned off by Bonhams auction house for $1,220—the actual Game Boy unit and game unit are seen in the listing photo here.